Few real-world signs of climate change are easier to read than changes in the growing season of familiar vegetation. From lilacs—which are flowering earlier—to allergy-causing ragweed—which is producing pollen longer into the fall, vegetation is reacting to Earth’s rising surface temperature. 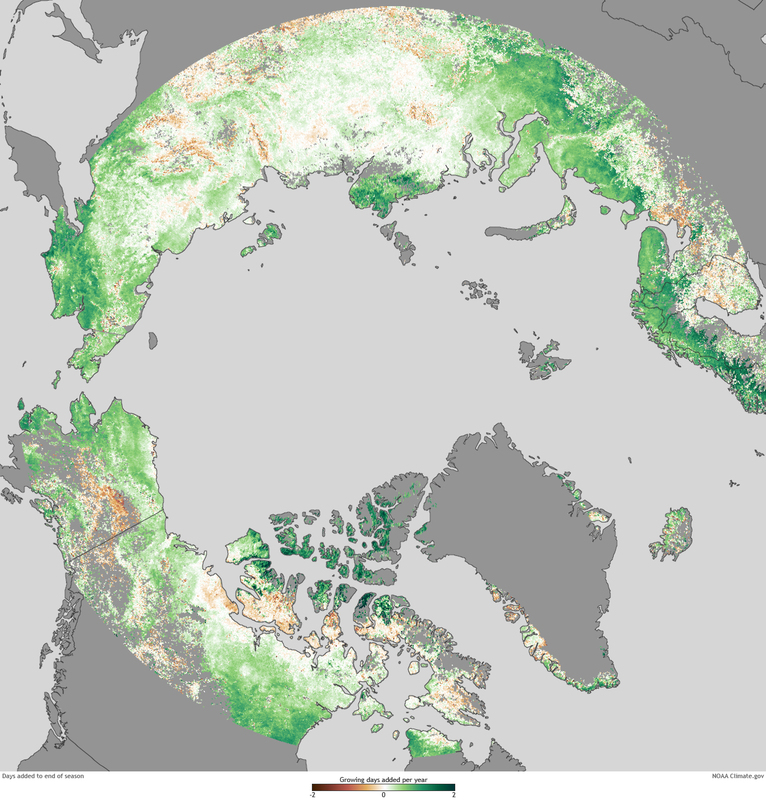 The map above shows changes in the length of the growing season in high northern latitudes based on satellite observations of vegetation “greenness” between 1982-2008. Green colors indicate places where the growing season increased by up to 2 days per year, while brown colors show places where the growing season became shorter by up to 2 days per year. 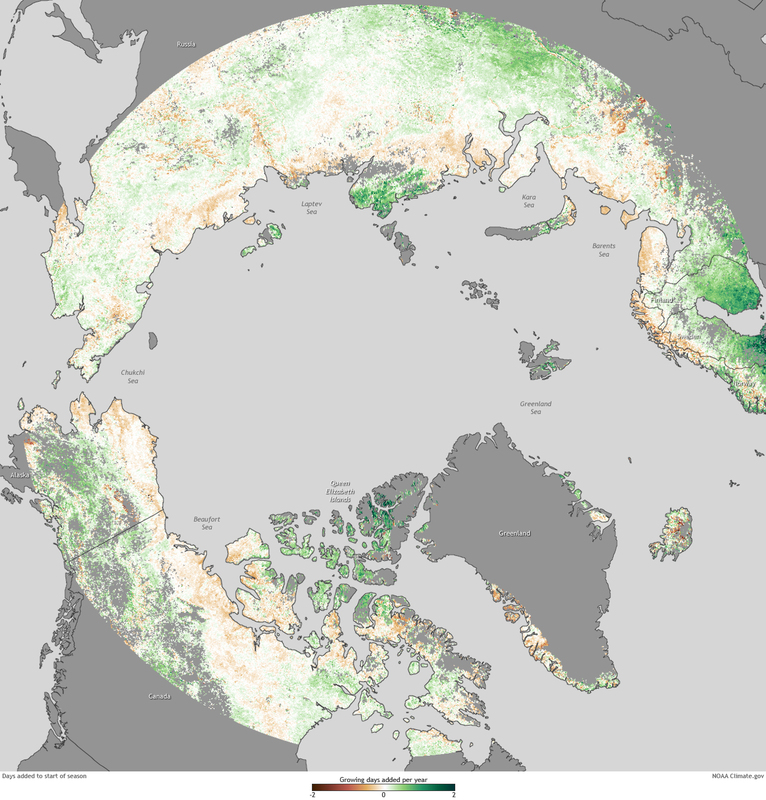 Greens dominate the map, indicating that most of the high-latitudes are experiencing longer growing seasons now than they did more than two and half decades ago. In a few places, growing seasons appear to have expanded by up to almost 3 weeks. However, in some places, the growing season has become shorter. Why are some places bucking the overall trend toward longer growing seasons? Numerous local factors could be at play, including changes in the timing or amount of precipitation or the drying out of soil due to higher temperatures. More details about changes in Arctic and high-latitude vegetation can be found in Chapter 4 of the 2012 Arctic Report Card. Map by NOAA Climate.gov team, based on data & analysis provided by Heqing Zeng and Gensuo Jia, Chinese Academy of Sciences; and Howard Epstein, University of Virginia. Caption by Rebecca Lindsey. Reviewed by Gensuo Jia. Climate change to increase water stress in many parts of U.S.